Happy Galentine’s Day, my beautiful tropical fish! In honor of my favorite fictional holiday (which really should be a national holiday), I want to take some time to celebrate the women of TV in a way that would make Leslie Knope proud. It’s going to be all about the love for the next few days here at NGN, and today I want to shine a spotlight on the love that can only exist between best friends. I wanted to make this list longer than a Top 3, but sadly I don’t watch a lot of shows with healthy examples of female friendship right now. Let me know in the comments which shows I should pick up someday to rectify that situation. 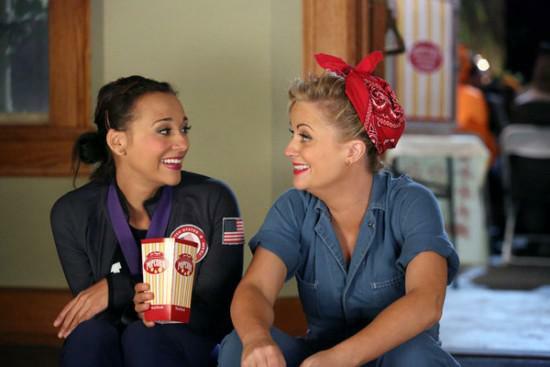 Without further ado, I present NGN’s Top 3 Female Friendships on TV Right Now. Theirs is a fairytale friendship unlike anything else on television, built on a message of supporting the people you love and accepting them for who they really are—both the light and the dark. Snow and Red are two incredibly strong women whose friendship only makes both of them stronger. They bonded through a shared sense of being outcasts, and they formed their own little family that both would do anything to protect. Love is the driving force behind Once Upon a Time, and it’s the love between these two friends that gives both of these characters more depth than your average fairytale women. It’s no coincidence that Snow’s happy ending after the curse was broken involved finding her husband and then running into the arms of her best friend. This show tells us time and again that there’s more than one kind of true love, and Snow and Red’s friendship is one of the truest loves on Once Upon a Time. “Hey, do you think if we met today, we would still be friends? Even though Jess lives with three guys (and is probably possibly in love with one of them), none of them will ever understand her or love her like Cece does. Like almost everything else on New Girl, the friendship between Jess and Cece is surprisingly realistic, a true depiction of lifelong female friendship. There’s a real sense of history between them, of secrets kept and memories made and milestones shared. They may be vastly different people living vastly different lives now, but they still respect and love each other—because that’s what best friends do. Sometimes they fight, but at the end of the day, they’re each other’s shoulder to lean on and ear to listen. Who would have guessed that a show essentially about the relationship between a girl and three guys would actually give us one of the most accurate and heartfelt female friendships I’ve ever seen in the media? No list of female friendships in the media is complete without Leslie and Ann. They support each other with a warm but strong determination that gives Parks and Recreation its beating heart. Leslie is never shy about her love for Ann, her admiration of her beauty and talent, and her dedication to their friendship. But it shouldn’t be forgotten that Ann is just as supportive and dedicated to Leslie and her dreams. It was Ann who helped organize Leslie’s campaign for city council before Ben took over. It was Ann who broke the news to Leslie about her victory after boxing with her to release some of the tension. It was Ann who helped bring Leslie and Ben together and back together. Ann was honest enough to tell Leslie to stop being a steamroller, and Leslie was honest enough to tell Ann to date herself. They want to help each other be the best they can be as women, and the show manages to find humor in that instead of in the two of them fighting over a man like so many sitcoms would resort to. My wish for every woman this Galentine’s Day is that she finds the Ann to her Leslie (or the Leslie to her Ann). This entry was posted in Television and tagged feminism, lists, nerd musings, new girl, once upon a time, parks and recreation, television by Katie. Bookmark the permalink. I love all of these friendships so much! I do wish there were more examples of female friendships on television. Angela and Brennan on Bones is probably my second favorite after Leslie and Ann. They are a perfect example of friends who are always there for each other and who help each other see the world in different ways. Speaking as someone who’s already found her Leslie, I couldn’t agree more. Every woman needs a friendship in her life as amazing as the one they share. I really do need to watch more Bones. I think as soon as it ends I'm going to marathon the whole thing because I think I'd really love it. Hmm, besides your examples, I keep trying to think of more examples but they are sadly hard to come by. Let’s see: though I don’t watch Grey’s Anatomy anymore, I think Cristina and Meredith are a great female friendship (or at least they were before my mid-season 5 stopping point). They clicked really fast, weren’t overly competitive with one another (beyond that natural of a competitive surgical internship), and were always there for each other. I was actually going to put Meredith and Christina on my list because I loved their friendship back when I watched the show (passionately from Season 1 to Season 3 and then sporadically through about Season 6). I’m not sure what their characters are like now, but I hope they’re still a shining example of friendship between strong, professional women. I know exactly what you mean about watching shows with females who are friends but never really getting to see those friendships. I want more Lanie and Beckett scenes so badly. I’d especially love one that’s not centered on the men in their lives. In my head, they have a really great friendship, but I’d love to see more of it on my TV. Red and Snow are definitely one of my favorite friendships, I love them so much. I’d add Belle and Snow as one of my other favorite current OUAT female friendships, even though we haven’t quite gotten to see them be awesome friends as much as Snow and Red. And Jess and Cece are one of my favorite things about New Girl (although really, what’s not to love?!). I’d also second Heather’s love of Angela and Brennan’s friendship on Bones, I love the way they are so different in some ways but have so much respect for each other and support each other. I also loved Sookie and Lorelai on Gilmore Girls, and I love Charlotte and Lizzie on the Lizzie Bennet Diaries (okay, I cheated, it’s a web series but I love them so much I couldn’t not mention them! This, btw, is a show that does have a good focus on the female friendships as well as the love life drama that naturally comes along with adapting the novel). And, on OUAT, when they were still under the curse, I loved Mary Margaret and Emma’s friendship. Not that I don’t like them now, but I guess I consider a parental relationship as a tad different than the way I’m thinking about friendships here. Also, agreeing with everyone in that I totally want more Lanie & Beckett scenes based around just their friendship (and not just them talking about love life ~drama). I wish I could think of more, but while I can think of plenty of situations where a whole team of people are like a family and I love their friendship, there’s usually not that many women as a part of that group, or at least there’s always more men than women. Which makes me sad now that I think about it. I really need to start watching Bones now!